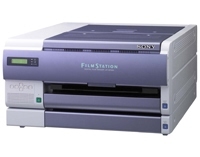 Sony is pleased to introduce the next generation FilmStation, the UP-DF550 Dual-Tray Film Imager. This new addition to the FilmStation family is a unique imager built on the design platform of the UP-DF500 FilmStation Imager. The Dual-Tray Film Imager incorporates many of the same features of the UP-DF500 and adds a second output tray to accommodate multiple film sizes including 8×10, 10×12, 11×14 and 14×17. This added feature gives the user a built-in capability to produce film prints for a variety of modalities, as well as low-cost copies (ideal for patient referrals). The UP-DF550 can be mounted horizontally or vertically, which is a major advantage over large centralized film imagers. The UP-DF550 Dual-Tray Film Imager is an ideal choice for many modalities, including CT, MR,DR and CR.